214 pages | 31 B/W Illus. Industrial engineering originated in the United States, and although the popularity of this discipline has grown worldwide, there is still little information available outside of the US regarding its practical use and application. Industrial Engineering Non-Traditional Applications in International Settings raises the bar and examines industrial engineering from a global perspective. Representing the best papers from the International Institute of Industrial Engineers (IIIE) conference held in Istanbul in June 2013, and developed by contributors from at least six different countries, this material lends their expertise on the international impact of industrial engineering applications and provides a thorough understanding of the subject. 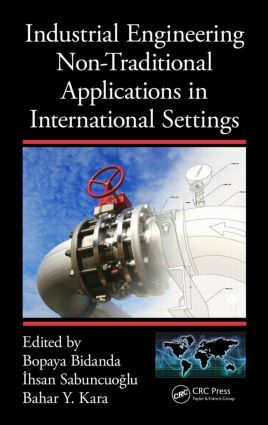 Focusing on two key aspects of the industrial engineering (IE) discipline, non-traditional settings and international environments, the book introduces applications and incorporates case studies illustrating how IE-based tools and techniques have been applied to diverse environments around the world. Each chapter represents a novel application of industrial tools and techniques. In addition, the authors highlight some of the more exciting developments and implementations of industrial engineering. The book enables both students and practitioners to learn from universal best practices and observe the international growth of the discipline. Industrial Engineering Non-Traditional Applications in International Settings explores the globalization of this expanding discipline and serves as a guide to industry professionals including systems, industrials, manufacturing engineers, design, production, environmental, and Lean Six Sigma engineers, and is also relevant to applied ergonomics, business scm, business logistics, and business operations management. "The value of this book lies in applying industrial principles and tools of IE to nontraditional areas. The chapters are presented like research articles. So, the book can be used for both teaching and research. More specifically it is an asset for research led teaching in the field of industrial engineering." Bahar Y. Kara is an associate professor in the Department of Industrial Engineering at Bilkent University. Dr. Kara earned an MS and a PhD from the Bilkent University Industrial Engineering Department, and she worked as a postdoctoral researcher at McGill University in Canada. Dr. Kara was elected as an associate member of Turkish Academy of Sciences in 2012. She has been acting as a reviewer for the top research journals within her field. Her current research interests include distribution logistics, humanitarian logistics, hub location and hub network design, and hazardous material logistics.